The only thing I love more than watching the Super Bowl is watching it with a mouthful of football snacks. And you know what I’m talking about when I say football snacks, right? (Everyone raises hand) Right! I mean bite-sized things we can lift, scoop or stuff into our mouths that are high-flavor and preferably high-calorie (because it’s not bathing suit season yet, so let’s just be honest). For me, the Super Bowl is an event that calls for two important menu items: beer and meat. Those can both be left open for endless interpretations and variations, but may not be excluded altogether at any cost. When developing a meat-based menu to fuel a three-hour event, it’s important to plan. 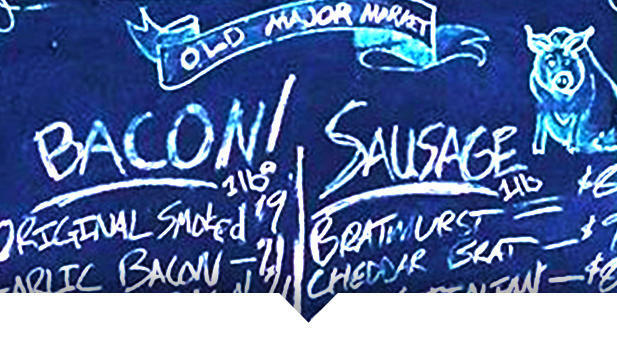 That’s why we had a chat with Mark LaFay of Old Major Market—he knows a thing or two about meat, and sells his own local meat products at the Fishers Farmers Market. Q: What kinds of Old Major products can we find at the Fishers Farmers Market? A: Right now, you can get your hands on all different kinds of bacon including beef and lamb, Wisconsin Bratwurst, Cheddar Bratwurst, Spicy Italian Sausage, Chicken Merguez, Tomato Basil Chicken Sausage, Chicken Bratwurst, Buffalo Chicken Sausage, Chicken Cordon Blue, Chorizo, Al pastor Sausage, Breakfast Sausage, Lincolnshire Sausage, 5-spice duck sausage and some other miscellaneous good eats. We are also in the process of rolling out a new line of terrines and pate. Q: You offer some unique products we haven&apos;t seen in many other places! What are some of your personal favorites? What would you encourage us to try, to expand our meat horizons? A: Like a proud father, I love all of my products equally. You don’t have to have a sophisticated palate to enjoy the different things we make. I’m an adventurous eater. So if you see something that you’ve never heard of, try it. We make a beef and lamb bacon that are both righteous. The biggest difference from pork bacon is the consistency of the fat and I love them both for that very reason. Our Al Pastor sausage is my own recipe. It is an explosion of spice and earth but it isn’t “hot.” It’s a blend of oregano, cumin, guajillo and ancho chiles, paprika, annatto and pineapple juice. 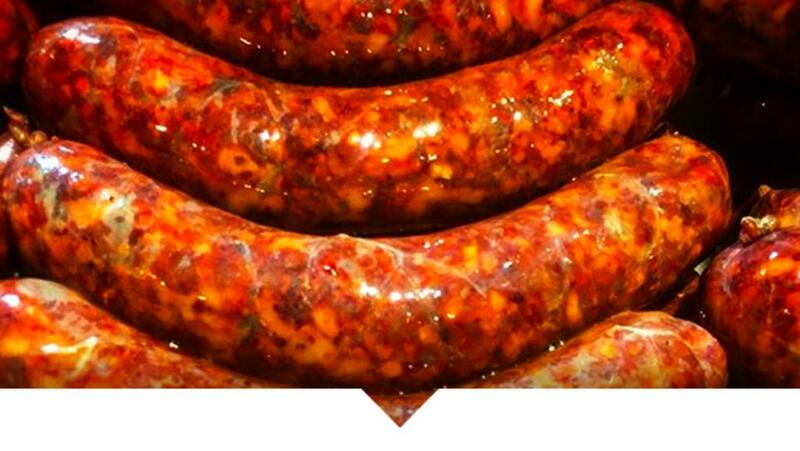 I love this sausage as a link or I’ll cook it out of the casing and use it in tacos. Q: The Super Bowl is coming fast, and we&apos;d love some suggestions for crowd-pleasing appetizers and munchies incorporating Old Major products. Got any for us? A: Easy is the key to a fun, delicious Super Bowl experience. I like appetizers that can be prepped in advance and only need to be popped in the oven right before go-time. Mini brats are great. If you can’t find mini buns, just slice regular buns into smaller portions, cut cooked brats to size and top with your favorite mustard and lots of sauerkraut. Italian sausage meatballs are great with marinara sauce. Bacon-wrapped dates stuffed with goat cheese are a great snack, and so are bacon-wrapped water chestnuts with a sweet Asian chili sauce. Mouth watering yet? Stop by the Fishers Farmers Market Saturdays at Billericay Park to check out Old Major Market and pick up your game day ingredients!